The Nevada Electric Highway program, administered by the Governor’s Office of Energy, added a DC Fast Charge site in Hawthorne near the intersection of US Highway 95 and US 50 Lincoln Highway. A DC Fast Charge station can provide electric power at a rate of 50 kiloWatts, about eight times faster than an SAE J1772 AC Level 2 electric vehicle supply equipment, usually rated at about 6.6 kilowatts. A Nissan LEAF or Chevrolet Bolt EV can recharge at a DC Fast Charge station in just 20 minutes to add a range of 100 miles, compared to 4 to 5 hours of time required to recharge at a J1772 AC Level 2 station. CHAdeMo plug for Nissan LEAF and other Japanese electric cars can provide DC Fast Charge at 50 kW. 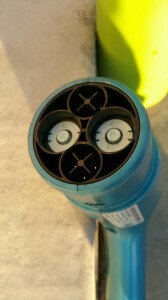 Each DC Fast Charge station will have two different connectors that are compliant with both the Japanese CHAdeMo plug-in standard, as well as the SAE Combined Charging System (CCS, also known as SAE Combo) that is popular in the US, Europe, and South Korea. 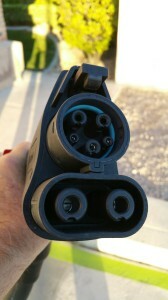 SAE Combo (Combined Charging System) for EVs manufactured by US and European companies, including the Chevrolet Bolt EV and BMW i3. Another DC Fast Charge site sponsored by the program is located at the Eddie World Gasoline station at 900 East U.S.-95 in Beatty, supported by Valley Electric Association co-op utility. The Fox Peak Gas Station, located at 615 E. Williams Avenue on Fallon Paiute-Shoshone tribal land in Fallon, also hosts a DC Fast Charge site. 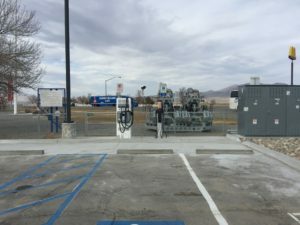 The new site in Hawthorne was installed at a rest area administered by the Nevada Department of Transportation, with funding and support from NV Energy, as well as the Nevada Governor’s Office of Energy. 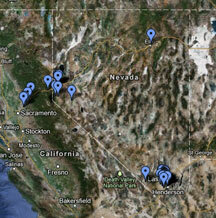 400 10th Street, Hawthorne, NV 89415.